On Thursday, Apr. 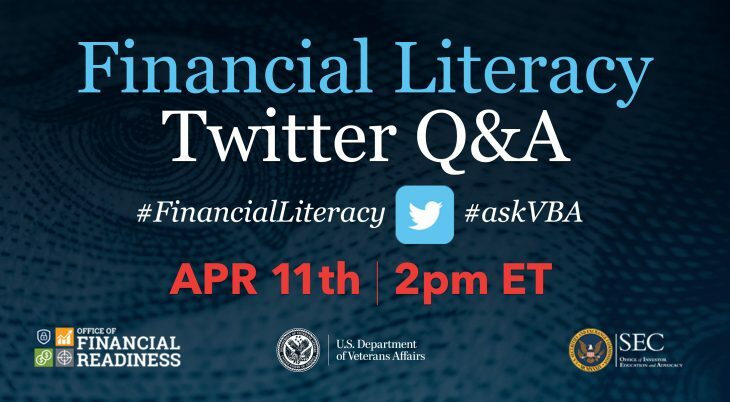 11, the Veterans Benefits Administration’s social media team hosted a Twitter Q/A with the SEC’s Office of Investor Education and Advocacy and the DoD’s Office of Financial Readiness to chat Financial Literacy. Since our Veterans and transitioning service members often receive five- and six-figure lump-sum benefits payouts and bonuses, we teamed up with our partners, above, to teach our social communities how to establish and maintain healthy financial habits. While we didn’t get a chance to touch on whether or not financing 20-inch dubs was really a smart idea, our partners bestowed upon the chat a trove of ideas and resources and links to help you decide for yourself. We have organized a non profit organization to help veterans get their benefits and understand their entitlements. How can we get information and some presentations?